After two unfortunate reschedulings and a surprisingly snowy weekend, the first exhibition of the year, "Reimagining A Lost Homeland: Ottoman Era Photography from the Dildilian Studio" opened at the Armenian Museum on the afternoon of Sunday, January 8th. 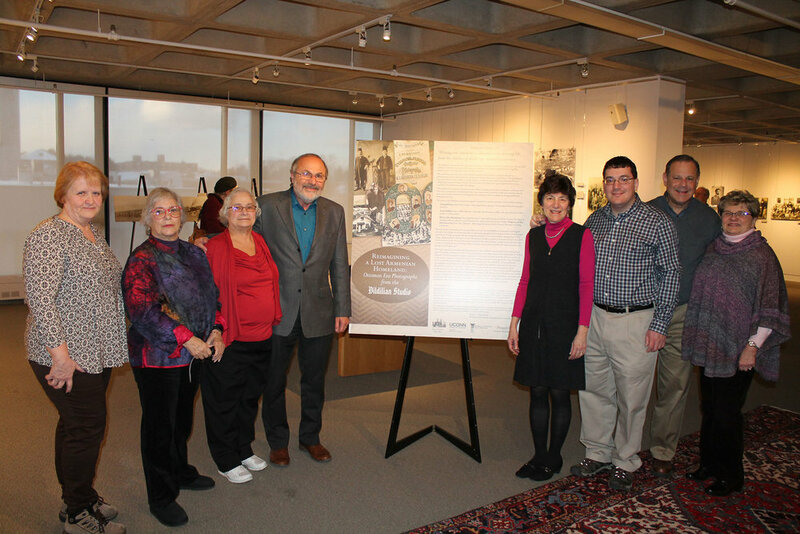 The exhibit creator, Dr. Armen Marsoobian, who is a descendant of the Dildilian Brothers, was able to make the trek up from his home in Connecticut to join the festivities, give an engrossing gallery talk about the show, and sign copies of his latest books. 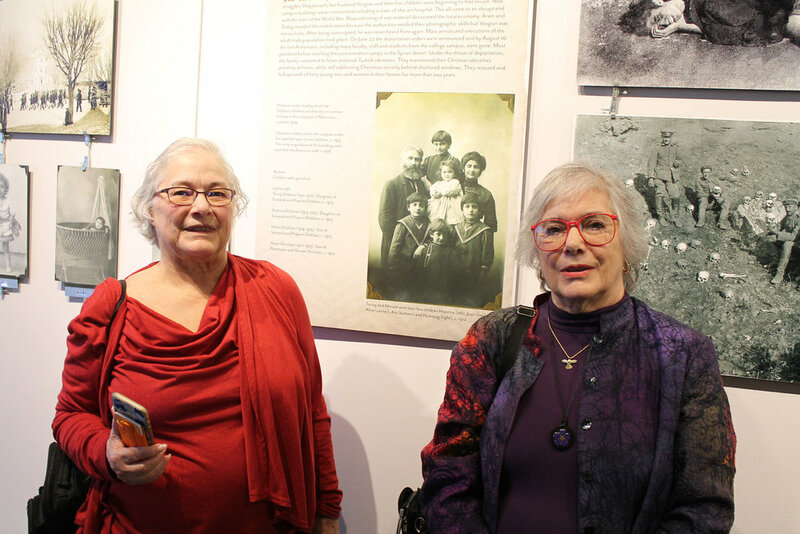 In spite of the weather, we enjoyed a fantastic turnout that included many other members of the Dildilian family descendants, along with Museum members and visitors who braved the snow piles to enjoy extraordinary examples of Ottoman-era photography and stories of the Dildilian Brothers. The exhibit, which is co-sponsored by Project SAVE , highlights the work from the Dildilian family’s business: a photography studio first founded in 1888. Unlike many of the more well-known photographers of the Ottoman Empire who practiced in Constantinople, the Dildilian family worked primarily in central Anatolia and the Black Sea Coast. The family business was first founded by Tsolag Dildilian in Sivas, or historic Sepastia, and studios were opened across the Empire over a period of 30 years in cities like Amasya, Konya and Adana. More than 900 photographs and glass negatives survived the period, along with family member’s memoirs describing events and life during the tumultuous and tragic period of the Massacres and Genocide. Approximately 150 enlarged reproduction photographs make up the exhibit, with subjects ranging from family members, community streets, buildings and colleges, hospitals, orphans, and atrocities from the Genocide, all accompanied by extensive eyewitness accounts from Dildilian family members. In his gallery talk, which was introduced by Armenian Museum Curator Gary Lind-Sinanian, and Project SAVE's Director and CEO, Ruth Thomasian, Marsoobian outlined the beginnings of the Dildilian portrait studio. "We've divided [the exhibit] into groupings," said Marsoobian while explaining the show's layout. The first section explores the family story and history prior to 1915. Marsoobian showed attendees the first photograph taken by his grandfather, which hangs at the beginning of the exhibit, "was taken in 1888 of his younger brother Ara, who then became his partner in the photography business after studying photography, not in France, but actually in Illinois in...I think it was 1905." He also explained during the gallery talk that the only photograph in the exhibition that is not a Dildilian photograph can also be found in the first section of the show, and it features German soldiers (visitors can hunt for this photograph in the first section of the exhibit!). The second portion of the show highlights portraits of Dildilian family members who did not survive the events of 1915. The family that was able to survive the Armenian Genocide, like Marsoobian's grandfather and mother, did so because the Ottoman military and civilian authorities needed their skills as photographers, and the Dildilians were allowed to remain in their hometown of Marsovan under the condition that they convert to Islam and adopt Turkish identities. Marsoobian also explained during the gallery talk that as a part of this agreement, his grandfather was made a member of the Ottoman army as a photographer and traveled around the Empire taking photographs for the government. The remainder of the exhibit highlights photography of community streets, buildings, colleges, hospitals, orphans and clients from the Dildilian studio. The final portion of the show includes an amazing 360 degree panorama photograph that was taken just before the first war of Anatolia College and the surrounding landscape. Marsoobian shared during the talk that before the Genocide, his grandfather was the College photographer and that to create the stunning image, "de took a series of 12 photographs of the whole landscape," from the roof of the Anatolia College Hospital, "and then attached them together to create the full image." Want to hear more about Reimagining a Lost Homeland? Keep up with us on Facebook, subscribe to our email list, and check our website events list to hear about future events featuring the exhibit and Dr. Marsoobian! You can also check our Twitter for video excerpts of the January 8th gallery talk. Dr. Armen Marsoobian is Professor and Chair of Philosophy at Southern Connecticut University and has authored a number of books on the Armenian Genocide and his family’s photography, including the latest release: "Fragments of a Lost Homeland: Remembering Armenia," which outlines the Dildilian family's experiences through memoirs, diaries, and letters, along with photographs and drawings.